Idiyappam / sevai is a popular and easily digestible dish of South India. We can make many varieties such as lemon sevai, coconut seva, etc., from the plain idiyappam that is prepared similar to Idli. Here I have shown a variety adding egg! Scramble the idiyappam / string hoppers into small pieces and keep aside. Beat the eggs with salt and pepper; Keep aside. Heat oil in a wide kadai; season with cardamom, cloves, cardamom, fennel seeds, curry leaves till it pops. Saute onions and chopped garlic, until colour changes. Add tomatoes and cook for few minutes until soft, continue adding the spices, salt, half the quantity of mint and coriander leaves. Saute till the raw smell goes (add little water, if it sticks to the pan). Add in the scrambled idiyappam and stir until the idiyappam blends with tomato spice mixture. Pour the eggs on center of the pan; slowly mix in the idiyappam mixture till it is blended and cooked well. Sprinkle remaining coriander and mint leaves; mix well. Serve hot with onion raita or gravy of your choice; preferably with chicken gravy. 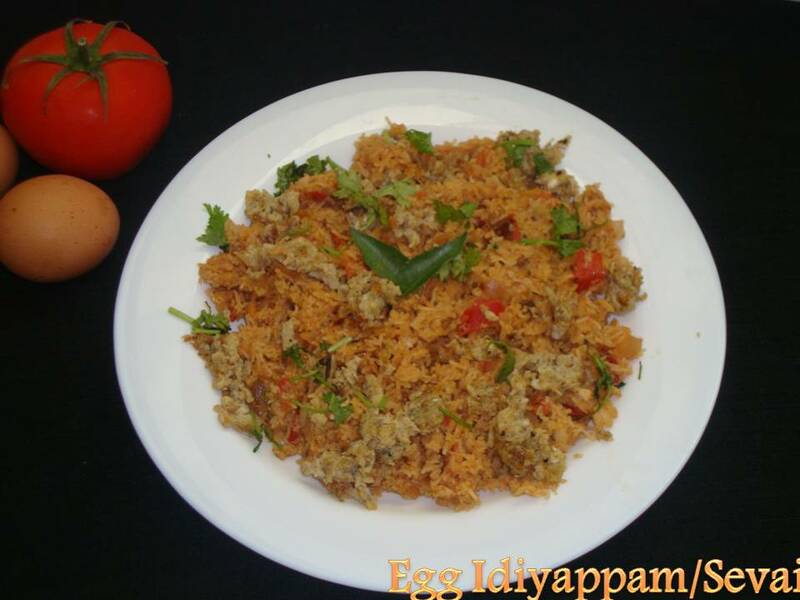 If you don't want to add eggs directly in the idiyappam mixture, you may scramble the eggs in a separate pan and add it to the mixture. You may also add ginger garlic paste for a different taste, instead of using only garlic. You may also use tomato puree instead of chopped tomatoes. Inviting food, prefect dish to start my day. This dish is new to me, very nice!